"Oakland Middle School piloted the Standards Based Grading (SBG) concept during the 2017-18 school year. Now in our 2nd year, Standards Based Grading is an innovation in education that focuses on learning and helps increase achievement. It is often combined with updated instructional practices and culture to better engage students and foster a positive environment." 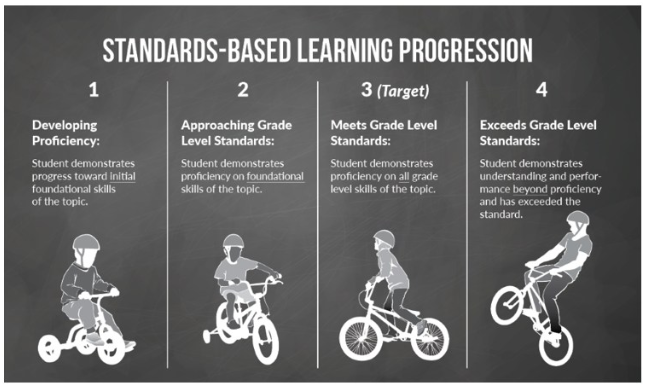 Standards Based Grading involves measuring a child's proficiency on the standard (concept) being taught. In other words, their grade will reflect what they know about what is being taught. Grades come from our assessments. Assessments can be short quizzes, longer tests, projects, or lab reports. 1 - the student still needs help. 2 - the student has a basic understanding but needs more practice. 3 - the student knows enough to pass the test (at grade level). 4 - the student understands and can teach it to someone else (above grade level).